The Book Lover’s Cookbook by Shaunda Kennedy Wenger & Janet Kay Jensen. Ballantine Books, 352 pages, 2003. ISBN: 0345465008. I confess I’m a cookbook freak, when I had a bigger kitchen I had a ridiculously large collection. Now, with a kitchen the size of a tollbooth, I don’t have so many, but I still troll for new additions. I don’t use a cookbook to cook, mostly I like to read them, like novels. Here’s a a little ditty, which I found quite interesting, and cheap too! For each recipe there is the accompanying mouth-watering section of the book which inspired the recipe. Cucumber Sandwiches from Women In Love, White Bean soup from Cold Mountain, Coconut Cake from Cold Sassy Tree, Fried Rice from the Good Earth (is that gastronimical profiling?) 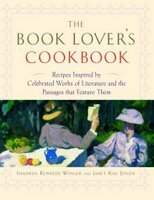 Every few years someone writes one of these literary cookbooks, and they are playful and fun reads.